Dropped lines at 4:00pm for a few hours of pre-Fourth of July fishing. Worked the 120-180 FOW north of the harbor with the action coming in 135-155 FOW. 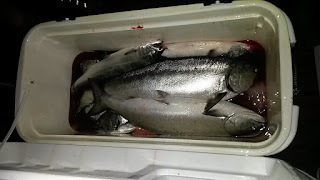 Landed 3 steelhead, one last year adult at 12+lbs and one modest coho. No kings on this trip. 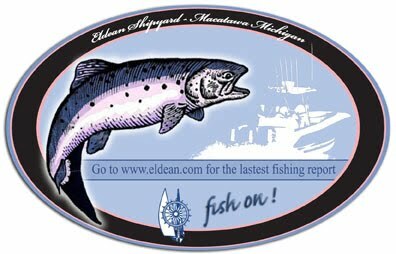 Steelhead appear to be be big and abundant this summer. All the action was on riggers, 65-80' down. Proctologist fly on a 8" chartreuse spinny and magnum holographic spoons continue to work well. Just one drive by on an orange crush dipsey and no action on the full copper line. Top water is beginning to warm up. Water flies are back but not too bad - get the flea flicker line out. And of course the biting flies are always around when its hot and flat. Got out Wednesday evening with Tom and Jeff. Went 5 for 7. Initially set up out the the harbor mouth in 120 FOW on a north troll. For the evening, worked 140-115 FOW both north and south half way to Port Sheldon and short of the sliders. 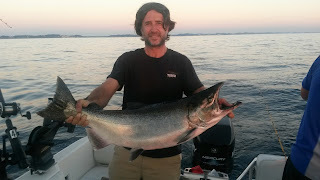 Boated two 12.5+ kings, steelhead 11.6lb and 8.6lbs and one small laker. Proctologist fly on a 9.5" chartreuse spinny 55' down on the SB aft rigger got hit 3X. The tail gunner holographic spoon set up the SB side rigger with light line, 65' down and 70' out got hit 3X. And one runner, likely a steely hit a double orange crush spoon on a dipsey about 40' down - we did not boat that one. Surprisingly, port side SWR was untouched all night. And no action on 100' and 200' of copper. The only action on 300' of copper was a massive tangle (thank you Mr. Steelhead) that decommissioned the set-up. Figure the spinny was doing the heavy lifting most of the night. Chatter seamed to be slow. Believe we had a lucky night coming in better than most boats. 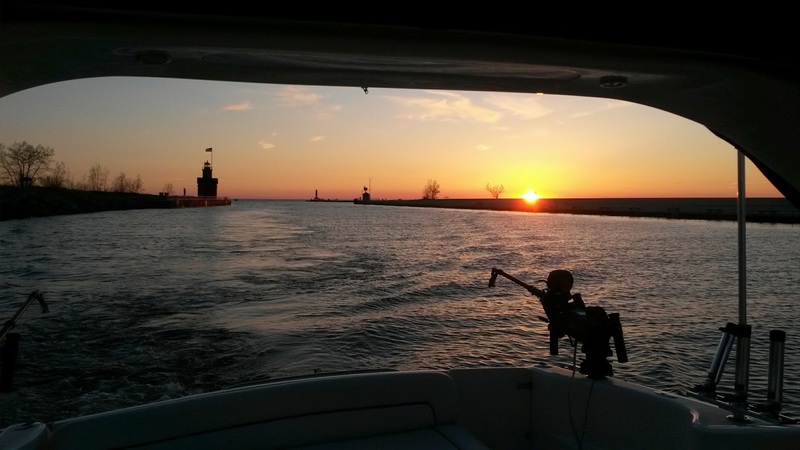 Friday was a beautiful night to be on the water. Got 5 of the 6 rods to go. 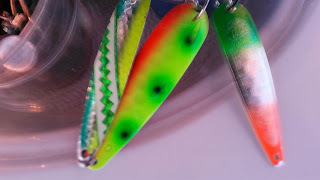 Wonderbread J-Plug on 300' of copper, SWR 70' down w/ green dolphin hologram, down rigger 80' down with a watermelon hologram spoon took a 10lb steely, and both dipseys fired at 50-55' down on a 2 set with a UV green dolphin and a mag black fin tuna that took a 10-12lb king. Little to no chatter on channel 68 other than a few comments on washing lures. I've talked with a few customers and the fish are biting. Big Kings are being caught west of Holland Good Lake Trout and Coho reports too from Holland to South of Saugatuck. Get out there for some good may fishing! Craig and I gave fishing a shot last night. Beautiful night on the Water! The fishing was slow and we went 1 for 1 fishing from 80 to 140 FOW. We caught a 15 lb Lake Trout on a meet rig down 100 in 128 FOW. I had heard that fishing was pretty good this past week and saw that Bending Limits had a dozen on Friday Morning. Craig and I went out from 6:30 to 9:30 Friday evening, but only had one hit and nothing to show for it. We fished from 100 to 175 and didn't see much on the screen either. I finally made it out fishing! Last night Capt. Jim and I took the Rhino out for the first trip of the year. Jim grabbed a bunch of his gear as I hadn't even been on the boat yet to take inventory. We didn't know where to go or what to use, but between 7-9:15 we went 7 for 10 (we missed the first 3). 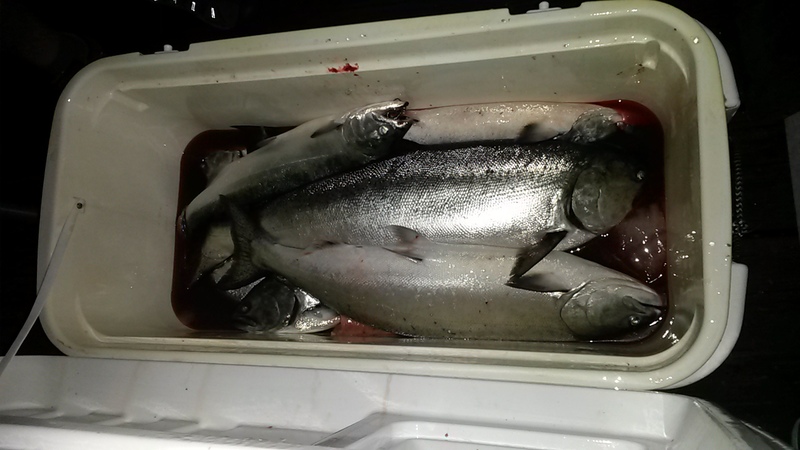 There were 6 nice kings, with the biggest at 15 pounds, and 1 coho. 100 to 140 FOW, mostly around 50 down. Lead, Copper, Downriggers and dypsys all went. It was a really great trip and I hope the fishing continues! Chuck, Kyle, Mark & I fished last night from 6 to 9pm in 180 to 255. We ended 2 for 3 catching fish in the 240-250 area. One coho on a green dolphin 70 down and a steelhead on 4 color with the golden carrot (carrot looking gold spoon pictured on last report. We missed a 2nd steelhead on the same set up as we watch it jump, jump, jump off the hook. So, we had more guys, more poles, but less fish. I keep forgetting the net, but I haven't lost one yet at the platform.